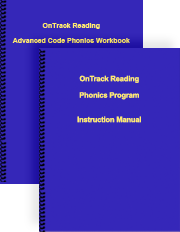 A thoroughly field-tested advanced code phonics workbook with comprehensive instructions. Free Phonics Assessment Tests enable measurement of phonics skills and code knowledge. An easy-to-teach, highly effective method that encourages decoding rather than guessing. The OnTrack Multisyllable Method broken down into ten 15-minute classroom lesson plans. Instructional tips, covering a range of topics, that have proven to be exceptionally effective.